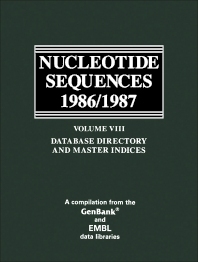 Nucleotide Sequences 1986/1987, Volume VIII: Database Directory and Master Indices presents data that reflect the information found in GenBank Release 44.0 of August 1986. This book provides information pertinent to the unique international collaboration between two leading nucleotide sequence data libraries, one based in Europe and one in the United States. Organized into 13 sections, this volume begins with an overview of the sequences, some basic identifying information, and some of the biological annotations. This text then discusses the EMBL Nucleotide Sequence Data Library, an international center of fundamental research with its main emphasis in the fields of cell biology, molecular structures, instrumentation, and differentiation. This book discusses as well the GenBank database established in 1982 by the National Institute of General Medical Sciences (NIGMS) of the U.S National Institutes of Health (NIH). This book is a valuable resource for molecular biologists and other investigators collecting the large number of reported DNA and RNA sequences and making them available in computer-readable form.